Do you love Paris, but think Parisians are rude? 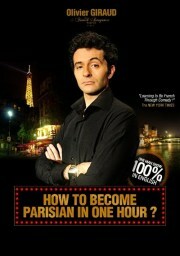 Are you too nice and want to learn how to become arrogant, just like the French? Want to learn how to act like a Parisian while shopping, in a restaurant, taxi, metro, night club, and even between the sheets -with vocabulary and facial expressions included? Oh là là! Then run, don't walk, to the funniest one-man show in Paris: HOW TO BECOME PARISIAN IN ONE HOUR, where you, too, can learn how to become a rude Parisian! Olivier Giraud is the witty Parisien behind this show full of 100% French humor, but 100% in English. La Mom and Big Cheese attended Olivier's spectacle recently and didn't stop laughing from start to finish. Neither did the +200 seat theatre filled with a large number of English-speaking tourists and Parisian locals. The jokes and body language were spot-on. Olivier even shared his struggle to bring the show to life. In typical fashion, Parisians were down on his idea and nobody wanted to rent theatre space to him, "Who wants to hear a Frenchman making jokes about Parisians in English?" Well, apparently people do and Olivier is having the last laugh. His shows are packed every week, he's moving to a larger theatre, and he's taking his show on the road to the USA in 2012! AFP: Heard the one about the French stand-up? Sounds like a great show! Separate but related, what's a potato square?? Paris Karin and I saw the show and it was fantastic. Thank you for introducing us to this wonderful comic! While I never felt the French were rude, his mastery of the hand gestures and timing was SO spot on. Pour le reste de la liste : j'adooore!